Some of these releases are virtually impossible to find and sell in the hundreds of dollars. A 100 PAGE BOOK with exclusive new information, unseen documents and colour photos covering the humble beginnings of Elvis Presley's music career and its effects on the birth of Rock n' Roll during 1953 -1954. A selection of photographs is used to accompany each song. THAT'S ALL RIGHT 45RPM SINGLE - PROCESSED AND PRESSED FOR THE FIRST TIME SINCE 1954 FROM THE ORIGINAL SUN MASTER'MOTHER STAMPER. THE RISE OF ELVIS PRESLEY - VOLUME II: 1955. BOOK - THE RISE OF ELVIS PRESLEY - 1955. The book containing nearly 400 pages of exclusive new information on Elvis Presley in 1955 is written by Joseph Pirzada and John Michael Heath with many contributors including Scotty Moore. See the hundreds of historical rare insider documents and photographs, many of which have never been seen before. This is a journey to over 300 shows that year (more than any other year in his lifetime) with great stories and exclusive new information on this most updated compilation on Elvis in 1955. ORIGINAL 45RPM SUN MASTER 223 MYSTERY TRAIN VINYL REPRESS. PROCESSED AND PRESSED FOR THE FIRST TIME SINCE 1955 FROM THE ORIGINAL SUN 45rpm MASTER 223'MOTHER STAMPER. The original Sun 223 45rpm issue of'Mystery Train' was Elvis Presley's last record on the Sun Record Label released in August 1955. Since then, it is now released here for the first time in its original format, processed from the same mother stamper Sun used in 1955. If you have never been fortunate to own the original we present'Mystery Train' back in its original format. DVD-VIDEO, DVD-AUDIO & DOLBY DIGITAL DVD DISC A. A - UNRELEASED FILM JIMMIE RODGERS MEMORIAL CELEBRATION MERIDIAN MISSISSIPPI - MAY 25TH 1955. THIS CLIP CONTAINS THE FIRST EXISTING KNOWN ELVIS FOOTAGE NEVER BEFORE SEEN. ELVIS PRESLEY - NEW YORK - RCA STUDIOS 1 - THE COMPLETE SESSIONS. First off the packaging is top notch and very much what we have come to expect from the MRS, it's well designed, good looking, well printed and presented and more than up to the usual high standard graphically. It stretches to 63 pages if you don't count the ads in the back and it does hold a couple of interesting shots (not too many) that are new to my eyes but this is only to be expected... After all where haven't you seen an Alfred Wertheimer. You can find them in many a book and magazine including the latest and greatest Elvis At 21. There is more to the book than just the photos though, look closely at the detail within and you will see some interesting RCA log sheets from 1956 that were re-issued in 1965 when the tracks appeared on the re-issued albums back in 65. Nice to see (to me) for the first time too. The text is written by a couple of folks listed as MMC and RM and covers the session ground accordingly and is pretty good reading. It's also good to see those other well known names tied in with this project too: co-produced by Joe Tunzi and additional research by John Michael Heath, Keith Flynn and Jamie Aaron Kelley, by fans for the fans. The book has a harder glossy cover than the previous MRS release Tupelo's Own and this is a good thing in my opinion, it feels more substantial. Chapters in the book are as follows. Elvis RCA NY The First Meeting & Publicity Photographs. RCA Studio 1 NY The First Recording Session - 30/31st January 1956. RCA Studio 1 NY The Second Recording Session - 3rd February 1956. RCA Studio 1 NY The Final Recording Session - 2nd July 1956. Primarily I was looking forward to the book more than the audio but boy, was I to be more than pleasantly surprised. In my opinion the work Kevan Budd did on the 56 tracks is awesome but he wanted to get back to a less compressed sound and to what Elvis himself heard live in the studio and he mastered that 110% on his FTD Elvis Presley. If I want to rock n roll loud and proud then I would play the New York sessions CD first every time as it jumps out at you and hits you hard... Very punchy and up front to my ears but it's all a matter of what you (and no one else) prefer. The CD is remastered and restored by Real Bouwman and the DVD audio engineer is Mick Ritchie. TUPELO'S OWN ELVIS PRESLEY. (MRS), the producers of this DVD. Well, we certainly do now! Elvis performing 6 songs, including. Live in Tupelo Mississippi 1956. Included we see a live performance of the elusive. Seen here for the first time ever. Previously there have basically been only a relatively small handful of live audio-only recordings, the 1956 (and early'57) TV guest appearances, the four pre-Army movies, and some unaccompanied short fifties concert film clips. MRS has ingeniously coordinated licensed, professionally shot black and white newsreel footage (taken at the afternoon September 1956 Tupelo homecoming concert) with the amateur recording made of the concert (which has previously appeared on the Elvis Presley Golden Celebration LP/CD box sets) and it blows you away! Not because of the quality of the footage and audio, but because of the combination! You can hardly believe your eyes and ears! There's screaming, there's the band and there's, above all, Elvis Presley moving around and working the crowd. Seeing and hearing Elvis perform such classics as'Heartbreak Hotel','Long Tall Sally' and'Don't Be Cruel' in this way is highly enjoyable. Unfortunately, there are only parts of'I Got A Woman' and'Hound Dog', but what there is shows Elvis really going wild in front of the screaming fans. One thing that I find interesting is that Elvis has his guitar strapped on for the whole show, except on the last song which is'Hound Dog'. On the footage from his show in Tupelo a year later, also included on the DVD, Elvis is without his guitar the whole time. This clearly gives him more freedom as he moves and gyrates even more on that show. Tupelo's Own Elvis Presley is without a doubt one of the most interesting releases in quite some time, and its importance as a historical document is priceless. After watching it, I'm sure you'll agree! There is also the audio of both afternoon and evening Tupelo concerts, accompanied nicely on the disc by a different photo of Elvis for each of the songs performed. The audio interview with Vernon and Gladys Presley. A previously unreleased Elvis audio interview and relatively short film footage (only) from the 1957 Tupelo concert the following year, round out the DVD, for under an hour and a half total running time. Despite the comparative brevity, I would consider this item to be essential for the avid Elvis fan, and a terrific pairing with the Elvis: Return to Tupelo DVD. 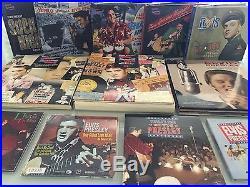 Which does contain fascinating and different material and interviews related to the'56 Tupelo homecoming concerts as well as going into Elvis' and the Presleys' lives before the family's 1948 move to Memphis. Please note that the DVD contains specially licensed footage by Fox. Further unseen footage contains backstage, the evening show, parade, Tupelo'57 and much more. The'parade' footage is good to see as it puts you in the right context with color and b&w footage. The interviews of Elvis' Parents are well worth hearing too. The afternoon show footage is wonderful and electrifying: Here is Elvis in his prime rocking and rolling in front of 11.000 people. Sincerely, this is the hottest Presley material I've ever seen. There are several complete songs. Heartbreak Hotel, Long Tall Sally, I Was The One, Don't Be Cruel. But even the snippets, bits, and pieces of. The set is housed in a nice (DVD case size) digipack format with 16-page booklet. This is an excellent release no fan should be without it. SUCH A NIGHT IN PEARL HARBOUR. In association with JAT Productions. Have released' Such A Night in Pearl Harbor. The quality is of this concert is far superior than anything of this ever released before and will now be considered, one of the best Elvis concert recordings up until that time. Elvis performs 15 songs and sings every one as if it were the first time he had ever presented them to an audience. This includes many #1 hits and includes classics that were never performed previously or again such as'A Fool Such As I','I Need Your Love Tonight' and more. It promoted the concert for the memorial fund, playing selected tracks from Elvis' Christmas and'His Hand in Mine' album, released at that time including words by Elvis Presley. Such A Night in Pearl Harbor CD / Book. TUPELO WELCOMES ELVIS PRESLEY HOME. Is an expanded edition of the original soundtrack album originally released in 1961. The CD contains many previously unreleased out-takes and alternate versions of the soundtrack recording including Elvis' number 1 hit,'Can''t Help Falling in Love'. Almost Always True (Take 1FS Take 8M) 03. Aloha Oe (Take 4FS & SPM) 04. No More (Take 1FS Take 13M) 05. Cant Help Falling In Love (Take 27FS Take 28FS Take 29M) 06. Rock-A-Hula Baby (Take 4FS Take 5M) 07. Moonlight Swim (Take 3M) 08. Ku ui po (Take 8LFS Take 9M) 09. Ito Eats (Take 6FS Take 7FS Take8FS Take 9M) 10. Slicin' Sand (Take 18LFS Take 19M) 11. Beach Boy Blues (Take 1FS Take 2M) 13. Island of Love (Take 11FS Take 12FS Take 13M) 14. Hawaiian Wedding Song (Take 2M). No More (Take 3LFS) 16. No More (Take 9) 17. Rock-A-Hula Baby (Take 1FS) 18. Ito Eats (Take 1MM Take 3FS) 19. Slicin' Sand (Take 15FS Take 16FS Take 17) 20. Beach Boy Blues (Take 3MM) 21. Island of Love (Take 3FS, Take 5FS, Take 10FS) 22. Aloha Oe (Take 2) 23. Aloha Oe (Take 3) 24. Aloha Oe (Take 5SPM) 25. Aloha Oe (Take 7SPM) 26. Aloha Oe (Master Of Section 2) 27. Cant Help Falling In Love (Take 1FS Take 2FS Take 3FS Take 4FS) 28. Cant Help Falling In Love (Take 5LSF) 29. Cant Help Falling In Love (Take 6FS, Take 7FS) 30. Cant Help Falling In Love (Take 8LFS) 31. Cant Help Falling In Love (Take 9) 32. Cant Help Falling In Love (Take 10FS Take 11FS Take 12FS) 33. Cant Help Falling In Love (Take 18FS Take 23MM). Regardless of whether you're a fan of the young, rockin' Elvis or the older, more mature Elvis, it can't be overlooked that both were born from a new form of music created at Sun Records in the summer of 1954. Of course, that is when a then-unknown 18-year old truck driver from Memphis stopped into the Sun Recording Studio. And cut a record as a gift for his mother's birthday. The rest, as they say, is history... The first thing that immediately strikes you with this latest package from MRS is the high-quality that MRS releases have now become famous for. And in such FANTASTIC quality! Captured inside the 92-pages of this deluxe, hardcover book are. TONS of released and unreleased photos. Taken at the Louisiana Hayride both on and off stage. These photos capture the young, innocent Elvis Presley as he begins his ride into superstardom. Presented along with these amazing photos is a wonderful essay by Joseph Pirzada, which illustrates for the fans Elvis' time spent on the Louisiana Hayride. Some newspaper clips, a copy of Elvis' first contract with the Hayride and other promotional Hayride pieces dot the landscape of the book as well. All of these visual goodies are presented on brown speckled colored pages, to give the reader a feeling that what they hold in their hands is a historical scrapbook, which is EXACTLY what this book is. The essay is very well written and presents fans with some interesting tidbits and information that help readers to perhaps better understand how Elvis' early career was taking shape. The book itself is made of a very high quality, with the glossy pages sewn into a thick, hardback book. Inside the back cover of the book comes the audio portion of the Hayride experience... Package presents fans with all of the known Louisiana Hayride recordings now assembled all in one release. From Elvis' first appearance on the Hayride on October 16, 1954. Through his final appearance on December 16, 1956. There are 27 tracks covering the 2+ years that Elvis was associated with the Louisiana Hayride. One of the most interesting things to hear as you listen to these performances is the confidence that Elvis clearly gains with each appearance, becoming more assertive and aggressive as he performs for the fans. Along with Elvis' increasing level of comfort, it's also interesting to hear the fan reactions with each subsequent appearance. From polite applause for his first appearance to outright pandemonium by the time he gave his final performance, listeners can clearly hear the increased excitement that Elvis caused as he continued to gain popularity. The material itself naturally consists of Elvis' earliest recordings from That's All Right. To Baby Let's Play House. Along with some of the cover tunes he was singing at the time including Tweedle Dee. But, the piece de' resistance of this set has to be the complete Louisiana Hayride concert which marked Elvis' final appearance in December, 1956. Recently featured in the RCA set' Young Man With The Big Beat. According to the producers, this concert has been'speed corrected' when compared to the'Young Man With The Big Beat' version and I have to agree. Not only does the concert sound more natural here, but it also sounds more in context here when presented with Elvis' previous performances on the Hayride. Regardless of whether you agree or disagree about the sound quality, the fact can't be argued that Elvis clearly had grown as an artist and performer. A short clip of June Carter. Telling a cute story about her time with Elvis on the Hayride along with a remixed version of. Elvis Presley was undoubtedly the pioneer of Rock N' Roll. His unique style of singing and performing started a musical movement that has been the road map for generations of performers to follow. A Must Have For All Fans!! The CD also contains the recent discovery of Elvis' last performance on the Louisiana Hayride in December 1956 as released on Sony's Young man With The Big Beat. This will be a more complete version of the show and for the first time, be. Which Sony has failed to master for their release. This CD is presented exactly the same as the MRS releases Off Duty With Private Presley Book Deluxe CD set and Tupelo Welcomes Home Elvis Presley : Deluxe CD set. The set also includes a 100 page hard back book with informative text and many rare and new photographs. OFF DUTY WITH PRIVATE PRESLEY. Off Duty With Private Presley. Celebrates the 50th anniversary of Elvis Presley''s discharge from the army in 1960. This book / CD set is in the same format, only even better than, the Tupelo Welcomes Home Elvis Presley. The CD contains recordings made during Elvis' time off duty whilst in the army with such classic''s as. A Big Hunk O'' Love. A Fool Such As I. It also has 30 Unreleased tracks privately recorded by Elvis while stationed in the US and Germany. These recordings are released officially for the first time to the public. As part of this audio/visual release, the accompanying 100 page book has many rare and stunning photographs, many of which are unreleased and seen here for the first time. It includes informative text and historical facts focussing on Elvis' time in the US Army from his induction in 1958, to his discharge in 1960. It also details the recording sessions (both private and commercial) made during this time. Size: 16.7cm (6.6") x 14.4cm (6") x 1.1 cm (3/4). Off Duty With Private Presley - 50 Year Commemorative Issue (19602010). Master Recordings RCA Studio B, Nashville Tennessee - June 1958. 01- A Big Hunk O'' Love 02- I Need Your Love Tonight 03- (Now & Then There''s) A Fool Such As I 04- I Got Stung. Private Home Recordings - Eddie Fadal Residence, Waco Texas - May 1958. 05- Sail Along Silvery Moon / I Understand Just How I Feel 06- Happy, Happy Birthday Baby 07- Dialogue 08- I Can't Help It 09- Dialogue 10- Who's Sorry Now 11- Who's Sorry Now Reprise#2 12- Happy, Happy Birthday Baby Reprise#2 13- Happy, Happy Birthday Baby Reprise#3 14- Happy, Happy Birthday Baby Reprise#4 15- Happy, Happy Birthday Baby Reprise#5 16- Happy, Happy Birthday Baby Reprise#6 17- Dialogue 18- Tumblin' Tumbleweeds / Blue Moon / don''t You Know I Love You 19- Tomorrow Night 20- Tomorrow Night Reprise#2 21- Little Darlin' 22- Monologue 23- Just A Closer Walk With Thee 24 Elvis Arrival in Germany - Ray Barracks, Friedberg 2nd October 1958. Private Home Recordings - Bad Nauheim, Germany - Summer 1959. 25- At The Hop 26- I'll Take You Home Again Kathleen 27- Que Sera Sera / Hound Dog 28- I Asked The Lord 29- I'll Take You Home Again Kathleen. Not on FTD Private Moment. 31- The Titles Will Tell 32- At The Hop / Give Me Oil In My Lamp 33- Que Sera Sera (Reprise#2)/ Hound Dog (Reprise#2) 34- Piano Solo 35- Send Me Some Lovin. BLUES - THE ALTERNATE ALBUM VERSION. With specially chosen alternate tracks this is a unique release and as an extra bonus there are. 7 tracks that are all previously unreleased. The album features 26 outtakes in total. Blues : The Alternative Album Version. Tonight Is So Right For Love (Take 9) 02. What's She Really Like (Take 13) 03. Frankfort Special (Take 8) 04. Wooden Heart (Take 4) 05. Pocketful Of Rainbows (Take 8) 07. Shoppin Around (Take 10) 08. Big Boots (Fast Version; Take 5) 09. Blue Suede Shoes (Take 1) 11. Doin The Best I Can (Master) 12. Tonight's All Right For Love (Master). Pocketful Of Rainbows (Take 7) 14. Shoppin Around (Version 2; Take 2) 15. Frankfort Special (Fast Version; Take 7) 16. Tonight Is So Right For Love (Take 4) 17. Whats She Really Like (Take 11) 18. Big Boots (Slow Version; Take 6) 19. Tonights All Right For Love (Take 1). Frankfort Special (Movie Version) 21. Shoppin Around (Movie Version) 22. Tonight Is So Right For Love (Movie Version) 23. Wooden Heart (Movie Version) 24. Pocketful Of Rainbows (Movie Version) 25. Big Boots (Movie Version) 26. GREATEST LIVE HITS OF THE'50's. The 24 track CD will contain only the best performance live tracks of the 50''s and will include 9 new performances that will now be released to the General Public for the first time as a new remaster. Included in the release will is newly discovered unreleased live version of. I Forgot to Remember to Forget.' recorded in October 1955 and a new song by Elvis titled. ONE-SIDED LOVE AFFAIR CD SINGLE (NOT THE VINYL RELEASE). What impresses most is the care with the artwork and presentation. CD single is printed with onto a black vinyl look. Not only that but it features a double cardboard sleeve plus a shrink-wrap so that the sticker doesn't ruin the front cover. It looks very stylish, if only BMG took the same amount of care with their releases. If you play the CD single on your P/C it is also enhanced with a bonus quicktime video version of Elvis singing'Don't Be Cruel' live in Tupelo from the 26th Sept 1956 homecoming. Right: The double cardboard CD single sleeve, including a mini HMV inner sleeve with purple and gold CD label. The video has been taken from the recent'Tupelo's Own' DVD. And is a very clever promotional piece, especially if you haven't seen film of Elvis live on stage in 1956. This is a cute bonus and the menu itself is a very nice design. While I do not know where M. Obtained the master tape from, the sound is not the same as Kevan Budd's fine audio work on his FTD release. Of course these are mono tapes so the audio difference has to be in the tape generation as well as the audio processing. On'My Baby Left Me' this HMV version has Elvis' vocal more prominent while Kevan Budd's version has a richer, cleaner bass. One Sided Love Affair' again has a higher Elvis vocal with less of a high-frequency end. The CD was mastered and authored by Mick Ritchie, the compilation was produced by Joseph Pirzada and co-produced by Joe A Tunzi. The item "ELVIS PRESLEY The Memphis Recording Service Collection (RARE, RARE, RARE!)" is in sale since Saturday, August 05, 2017. This item is in the category "Music\CDs & DVDs". The seller is "jasperbrett" and is located in Robina, QLD.